An important Nike brand value is that everyone is an athlete, and we created a space that would cause any visitor to establish an emotional connection to this. It's designed to be more than a workout space and more than a product display. The Nike Studio Beijing magnifies Nike’s brand values of empowerment, inclusion, and audacity manifested in a physical space for people to actually visit and experience. 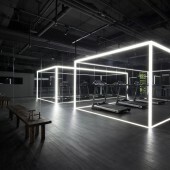 Nike requested a pop-up space that embodied infinity and empowerment while promoting their new collections and Nike+ Run Club. We came to Nike with a pop-up brand space that simultaneously showcases their products and provides a space for customers to put those products to the test, all while redefining what it means to be “in the zone”. The project launched in August 2015 alongside the World Athletic Championships in Beijing, China. 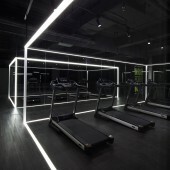 Nike Studio Beijing Retail Pop-Up by Coordination Asia is a Nominee in Interior Space and Exhibition Design Category. · Click here to register today inorder to be able to view the profile and other works by Coordination Asia when results are announced. Nike Studio Beijing Retail Pop-Up by Coordination Asia is Winner in Interior Space and Exhibition Design Category, 2016 - 2017. · Press Members: Login or Register to request an exclusive interview with Coordination Asia. · Click here to register inorder to view the profile and other works by Coordination Asia. Did you like Coordination Asia's Interior Design? Did you like Nike Studio Beijing Retail Pop-Up? Help us create a global awareness for good interior design worldwide. Show your support for Coordination Asia, the creator of great interior design by gifting them a nomination ticket so that we could promote more of their great interior designs.